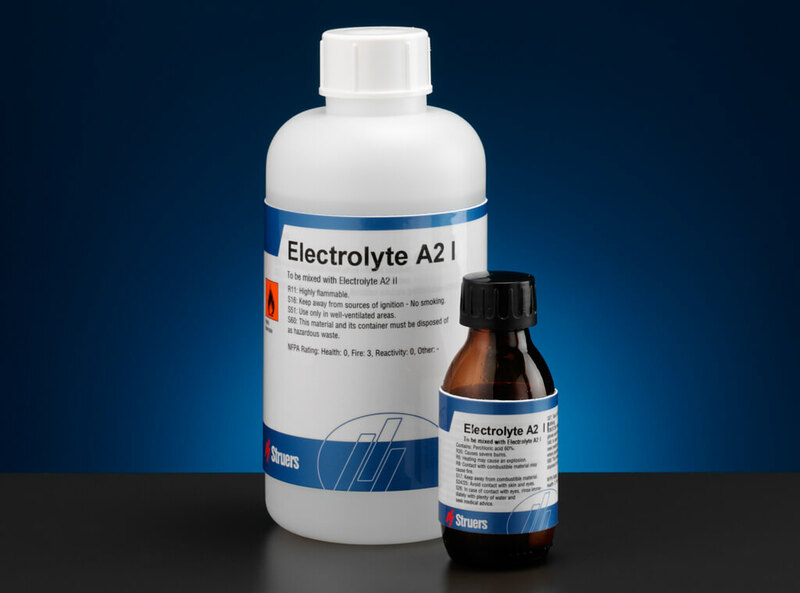 Prepare thin specimens for transmission electron microscopy in minutes. The TenuPol-5 is designed for automatic electrolytic thinning of specimens for examination in a transmission electron microscope. Establishing parameters for new materials and storing them in the method database is simple, using the built-in scanning function and additional enhancement functions. The TenuPol-5 consists of two separate units - the control unit and the polishing or thinning unit. A perforated specimen for transmission electron microscopy is prepared in a few minutes using a sample with a diameter of 3.0 or 2.3 mm. 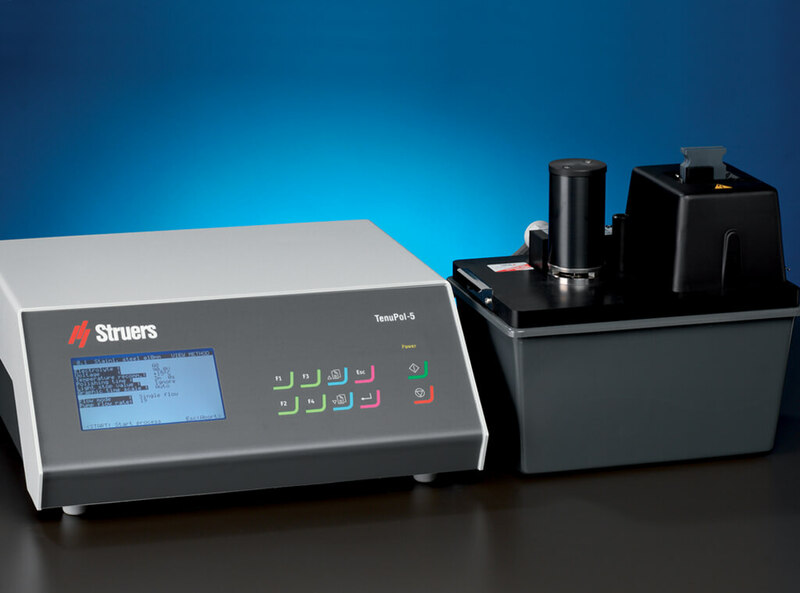 TenuPol-5 is equipped with a unique scanning function that scans a pre-defined voltage range to determine the current density curve. 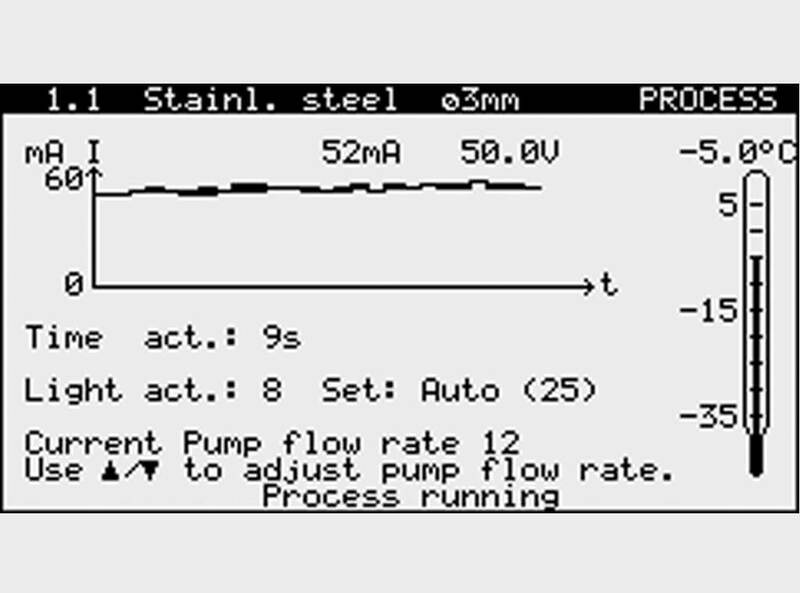 This curve is used to define the correct polishing voltage for the thinning process, allowing the user to store the parameters in order to find the correct method settings again after a single scan of a new material sample. The TenuPol-5 comes with filter and enhance functions to facilitate finding the correct voltage settings for polishing and etching. The built-in method database contains 18 Struers methods and up to 200 user methods. 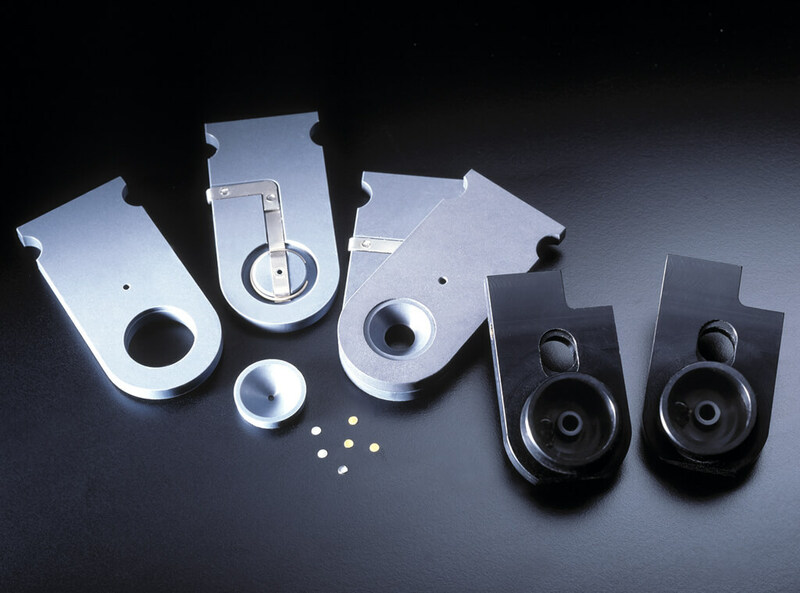 The 18 methods consist of eight methods for pre-thinning and ten methods for the final thinning of various materials. This means that the user can prepare a wide range of materials immediately without time-consuming trials. The user can also use the methods in the database as a starting point for developing their own methods for other materials. The specimen is polished from both sides simultaneously, thus providing a structure with an absolute minimum of deformation. When the perforation appears, the polishing can automatically be stopped by the infrared detector system, and the specimen is ready for TEM examination. No special operator training is required. As soon as a hole appears in the center of the specimen, the process is shut off in accordance with the pre-set light stop value. 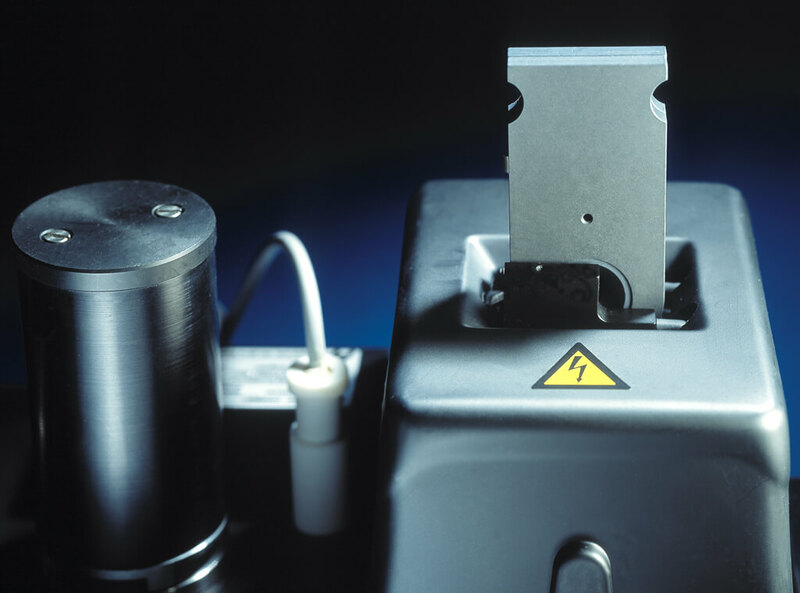 The basic material with a diameter of 12‑21 mm is pre-thinned using a special specimen holder to a thickness of less than 0.5 mm in an area up to 10 mm in diameter in order to avoid deformations of the finished sample. 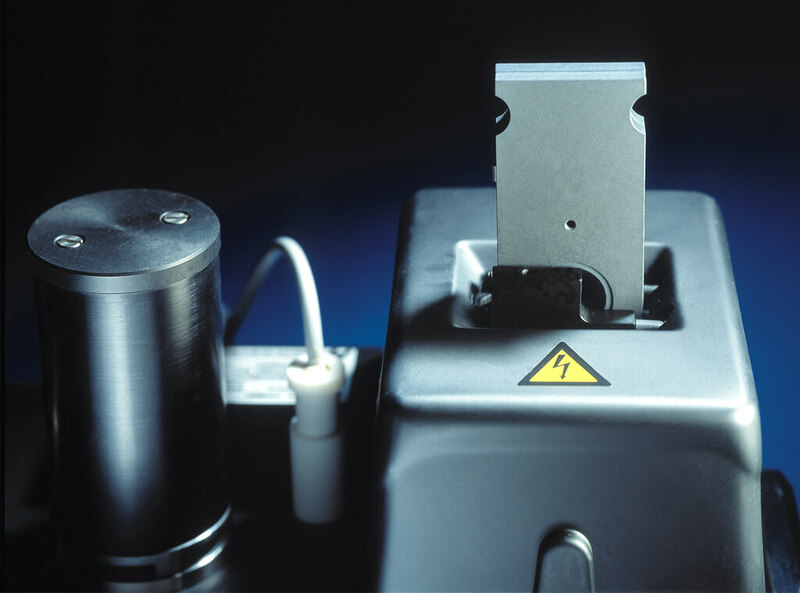 TenuPol-5 enables electrolytic “punching” of several 3.0 mm (or 2.3 mm) specimens from the foil material without introducing any deformation at all. TenuPol-5 is made of corrosion‑resistant materials, allowing for polishing using most chemicals such as perchloric acid and other highly corrosive electrolytes. TenuPol-5 consists of two separate units, the control unit and the polishing or thinning unit. The control unit contains the power supply and the programming and monitoring functions. Touchpad operation and a back-lit display of all parameters, such as current, electrolyte temperature, and elapsed thinning time, enables monitoring of the entire process. The separate unit design enables the polishing/thinning unit to be placed away from the control unit in a fume cabinet, for example. The TenuPol-5 comprises two electrolyte reservoirs, an insulated one for use with the built‑in cooling coil, and an uninsulated one for cooling the electrolyte. Control unit, with electronic thermometer and adapter for the connection of TenuPol polishing unit, with specimen holder for three mm dia. specimens, sets of jets, pump, cooling coil, insulated PVC container, non-insulated PVC-container, and a built-in photo cell.